Located in San Diego and with San Diego Convention Center reachable within 500 metres Pendry San Diego features an outdoor swimming pool rooms free WiFi and a fitness centre. 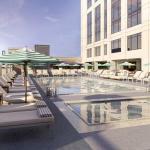 Located in the Downtown San Diego district the property provides guests with access to a restaurant. The property is 500 metres from Downtown San Diego. All guest rooms at the hotel come with a seating area. Every room has a private bathroom with a hair dryer. At Pendry San Diego each room is fitted with a desk and a flat-screen TV. At the accommodation guests are welcome to take advantage of a hot tub. You can play darts at Pendry San Diego and car hire is available. Popular points of interest near the hotel include Petco Park Gaslamp Quarter and Spreckels Theatre. The nearest airport is San Diego International Airport 4 km from the property.